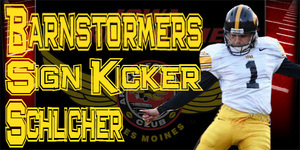 04/28/2011 4:13 PM - DES MOINES – Iowa Barnstormers Head Coach and Director of Football Operations John Gregory announced today that the Arena Football League team has agreed to terms with free agent kicker Kyle Schlicher. Schlicher (5-9, 184) is best known to Barnstormers fans for his four-year career at the University of Iowa from 2003-06. By signing with the Barnstormers, this will be Schlicher’s first venture into professional football. The Ankeny, IA native returns home after spending the last 4 years working as a strength and conditioning coach for U.S. Navy SEAL candidates at the Great Lakes U.S. Naval Base in Illinois. While with the Hawkeyes, Schlicher connected on 51 of 67 field goal attempts along with 107 of 112 PAT’s. His 260 points scored is the fourth most in University of Iowa history. In 2004 he tied Iowa’s single season record for field goals made with 24. Schlicher will make his Barnstormers debut this Saturday night when Iowa hosts the Philadelphia Soul at 7:05pm. The Soul features the return of former Barnstormers QB Ryan Vena and DB Tanner Varner. Saturday night is Casey’s night with the Barnstormers. The first 3,500 fans through the gates will receive a free can koozie courtesy of Casey’s. Tickets can be purchased now at the Wells Fargo Arena box office, by calling 515-633-2255 or online at www.theiowabarnstormers.com.